Barb Sorg – Can We Blunt Drug-Related Memories? | WSU Vancouver ResearchNow! The circumstances that lead someone to abuse drugs may also make it harder to quit. Barb Sorg, professor of neuroscience at WSU Vancouver, hypothesizes that people develop powerful drug-related memories that are implicated in relapse when they try to quit. These cues may be internal (euphoria from the drug) or external (the environment, certain people, or drug paraphernalia). The cues evoke emotions associated with the drug and make the drug harder to resist. Sorg wants to learn how to blunt those memories. Memories go into a sort of memory bank, where, Sorg said, a memory is “reconsolidated” to maintain it in that memory bank. Drug cues can bring back the memory. drug memory is weaker—making the drug abuser less susceptible to relapse after encounters with drug cues? Sorg is investigating that question with lab rats who are addicted to cocaine. 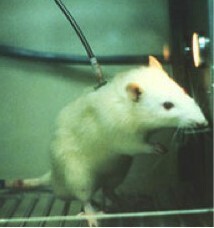 The rats can administer a dose themselves by pressing a lever. Some are given a pharmacological agent to inhibit the drug memory. So far, it appears these rats are less inclined to press the lever—meaning they are less interested in the cocaine when their drug memory is disrupted. They haven’t forgotten the cocaine, but their motivation for it is diminished. “You want them to have the memory, but not the emotional context,” Sorg said, noting that the research has relevance for other memories besides drugs. The concern now is to replicate the result and test it with other pharmacological agents to learn what works best. This entry was posted in Substance abuse and tagged drugs, neuroscience. Bookmark the permalink.